Solar panel cleaning is not really that different from cleaning your car windscreen. A solar panel typically consists of solar cells covered by a protective glass coating, and just like your car windscreen – the longer it’s outside – the more likely it will get dirty and need to be cleaned. Experts agree that dirty solar panels don’t produce as much power as clean panels. That loss is very hard to estimate but figures like 25% or 30% are quoted by some. According to the National Renewable Energy Laboratory, dirty solar panels won’t create as much power as clean ones. The loss can be up to 25-30%. It is therefore recommended that solar panels are cleaned twice a year. Cleaning solar panels on your own can be risky. 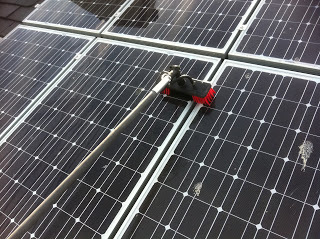 Because Kristall Clean has the right tools and techniques for cleaning them safely, you should contact us to clean your solar panels. Depending on conditions it is recommended that they are cleaned 2-4 a year to keep their performance at an optimum. We do not use standard window cleaning tools or detergents when cleaning solar panels. This is because they will end up leaving soap residue and water spots as the solar panel surface dries reducing their efficiency. We use the same ‘water fed pole system’ that we use for your windows – purified, de-ionised water with no detergents. That way we clean the panels without leaving streaks or spots. We can also reach the panels from the ground minimising the risk of damage to the panels (and ourselves!). Please get in touch via email if you would like to book a clean.